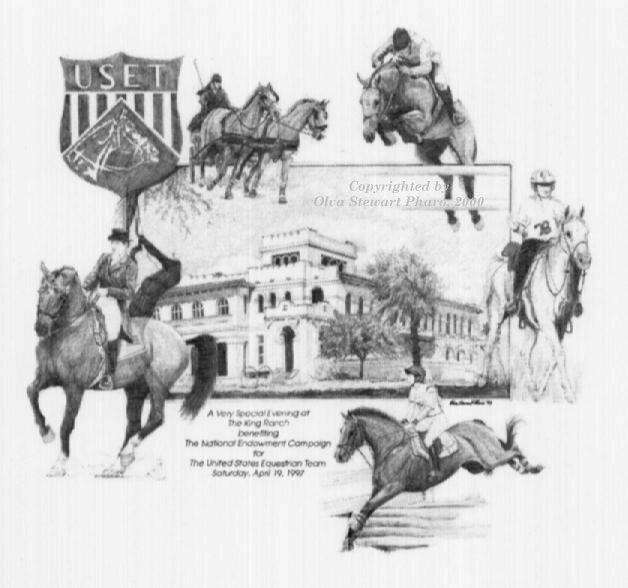 Official Artist of the Texas Region of the 1997 National Endowment Campaign for the USET. The original artwork was donated for auction by the artist to the USET. Signed and numbered prints (11" x 17") are available at $30.00 each. A limited number of artist's proof (11" x 17") are available at $40.00 each. 5-1/2" x 4-1/4" note cards (10 cards & envelopes) are $10.95. Add $4.05 shipping for each package of note cards; $6.95 for prints. Send check or money order to: Olva Stewart Pharo, P. O. Box 625, Dept. WUSET, Cypress, TX 77410. Texas residents include 7.25% tax. Equestrian Portraits by Olva Stewart Pharo, unique portraits.